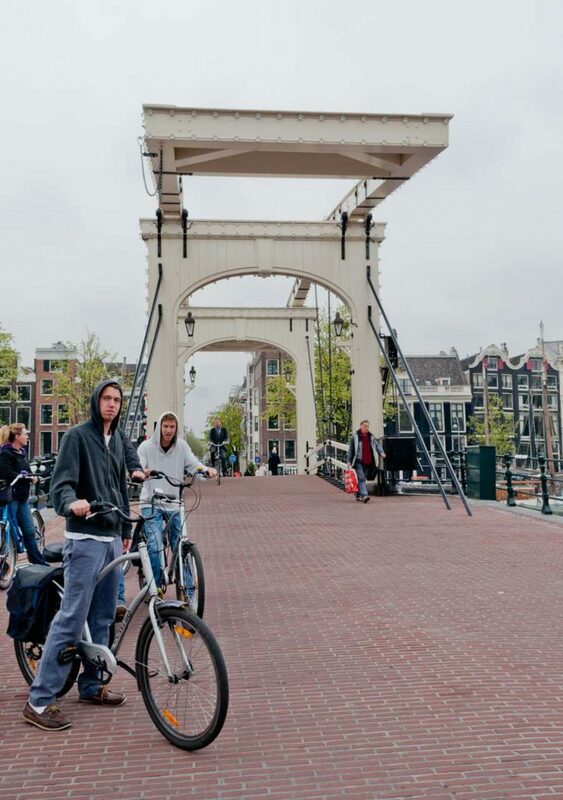 Review: Mike's Bike Tours, Amsterdam - WattWhereHow? 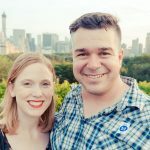 Mike’s Bike Tours started in Amsterdam and is now franchised across the continent. 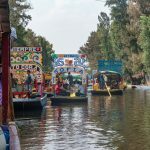 They offer cheap, informative tours and bike hire, giving you a healthy way to see more of a city than if you were to walk it or go via the underground (not really an option in this waterlogged city). We’re greeted by a friendly and intelligent Dutch man whose accent is more Oxford than Amsterdam. He quickly comes clean. He’s not Mike; he’s Stuart. Mike is probably some wealthy old man sitting by a fireplace counting his guilders and Euro, leaving the dirty work to the professionals – and this guide is a smooth operator. 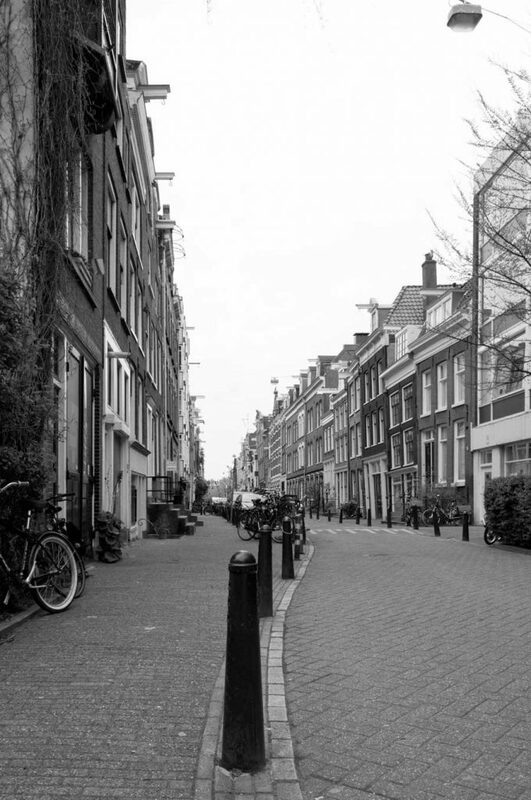 He leads our team of twenty or so cyclists on a merry ride through the backstreets of the ‘dam. As we find our feet and then the pedals, we hit the road, juddering over the uneven cobbled streets. It’s not exactly smooth sailing and we are quickly taught the Dutch rules of the roads, when to stop for traffic, when to avoid trams and how to minimize the angst when blocking the locals’ daily commute. I ride at the front with Stuart, getting an insight into his life story and in-depth descriptions of the buildings we are passing. He’s a chef who has also studied media and journalism and has spent a lot of time in England, the reason his accent is so indistinguishable. Jess has seemingly disappeared en route. Actually, it’s off route. She’s taken a tumble, collecting parts of the body that shouldn’t ever hit metal on impact. She’s a little worse for wear and her bike will never be the same. For the rest of the tour, bike and rider limp along the route. The gears aren’t working and the chain just doesn’t want to go back on correctly. Back at the front of the peloton, we pause at one of the iconic bridges. Here we learn of the birth of the city and the way it was built. The tall skinny houses are built on foundations of alternating layers of leather and sand, which compresses under the weight of all that designer furniture and debt. 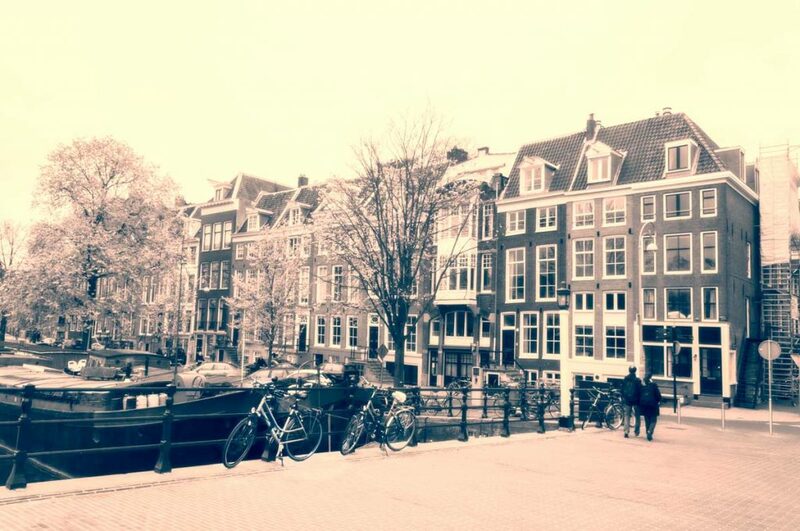 Further along the canal side, we learn how parts of post-war Amsterdam became havens for squatters, particularly the Jewish quarter, which was pillaged by the Nazis and then the locals after the Jews were deported to concentration and extermination camps. By the winter of 1944, the country was collectively starving and whilst experiencing a particularly bleak winter, locals stripped many of the empty houses, burning the furnishings and fittings to stay warm. By the late 1960s, these rundown properties became temporary housing for students, radicals and bohemian artists. The landscape quickly changes as cobblestone turns to asphalt and canal to river. 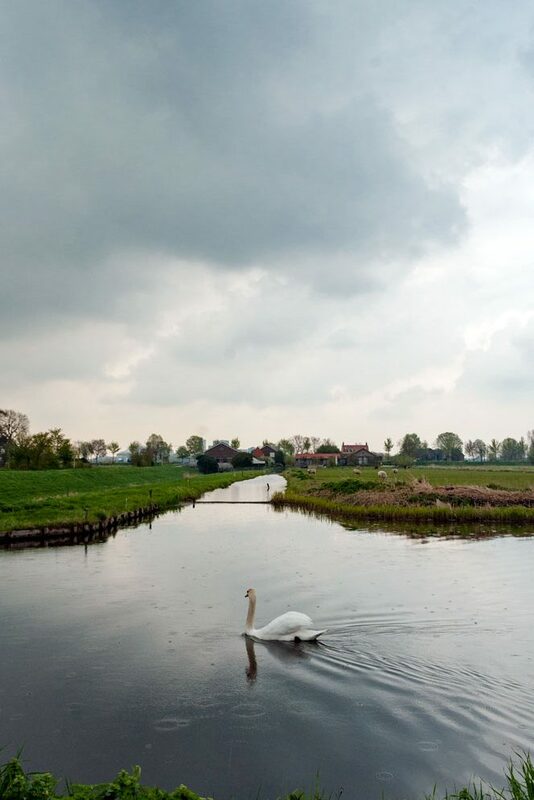 Riding along the banks of the Amstel River is serene, the emerald green landscape even more contrasting against the thick grey clouds rolling in. 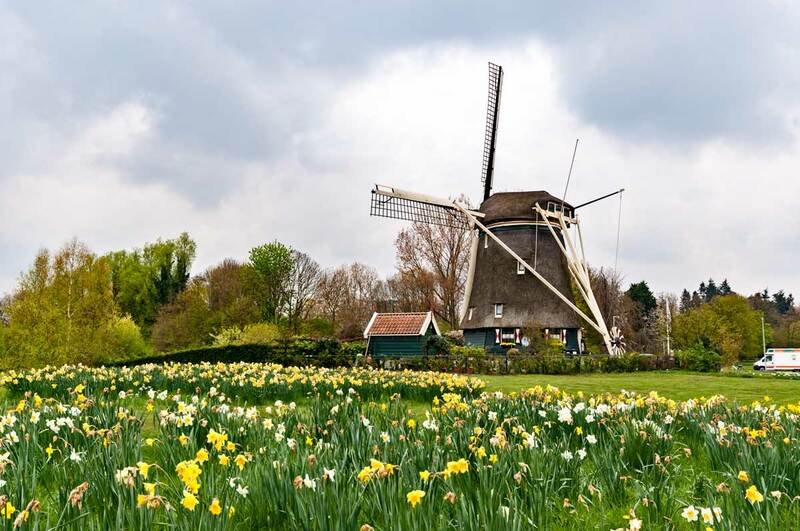 We whiz past multi-million dollar mansions and summer homes before turning into a picture perfect scene, a windmill, Rieker Molen, surrounded by yellow and gold tulips, the first flowers of spring. It’s quintessentially tourist-friendly but still makes for a great photo. Continuing on, we turn down a muddy driveway and roll into the courtyard of an old-style farm. Dodging geese, duck and farmhands, we drop our bikes under a tree and regroup for a welcoming beer. Looking around, it would appear the savvy farm folk have capitalized on their close proximity to the capital and turned their farm into a tourism cash cow. The first area of the converted barn is a cheese-making operation. They make beautiful smoked cheeses as well as a range of other tasty fromage. 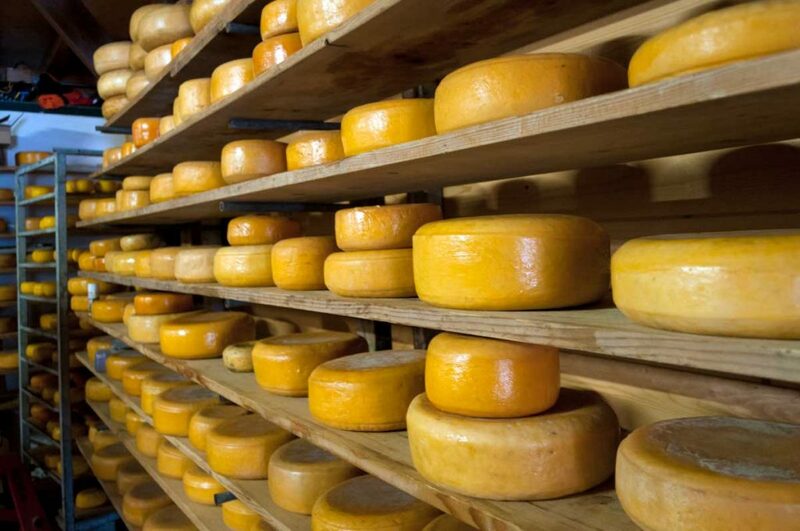 Giant wheels of cheese are stacked high on stainless steel racks, a light mold growing on their waxen exteriors as they age. Bacteria never tasted so good. Moving into a noisier, dustier section of the farm is a working clog factory. An engaging chap willfully demonstrates his craft, much of it performed by an ageing but still sophisticated piece of machinery, quickly turning a log into a clog. Even the offcuts are used to make mini novelty clogs. There are clogs hanging from the roof, clogs piled against walls. Raw timber clogs, brightly painted and stained clogs, clogs with intricate scalloping carved into the wood. The aroma of sap and timber color the air just enough as to not cause a sneezing attack. 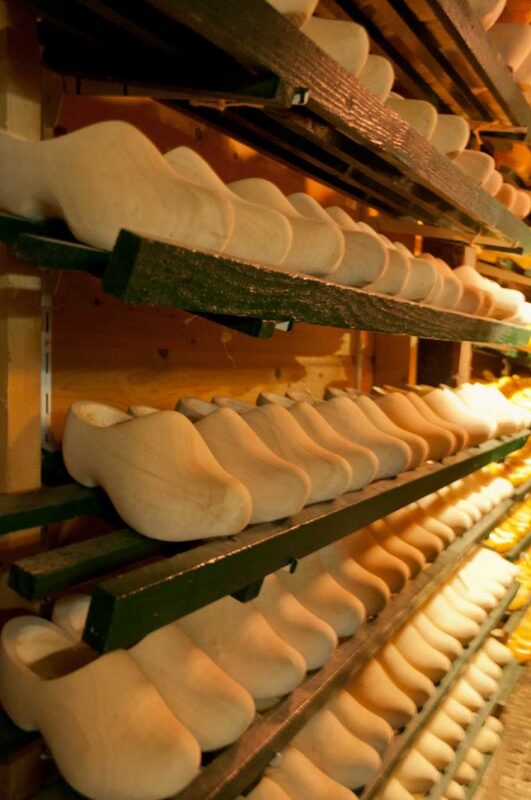 The clog maker is as much an artisan as a showman. 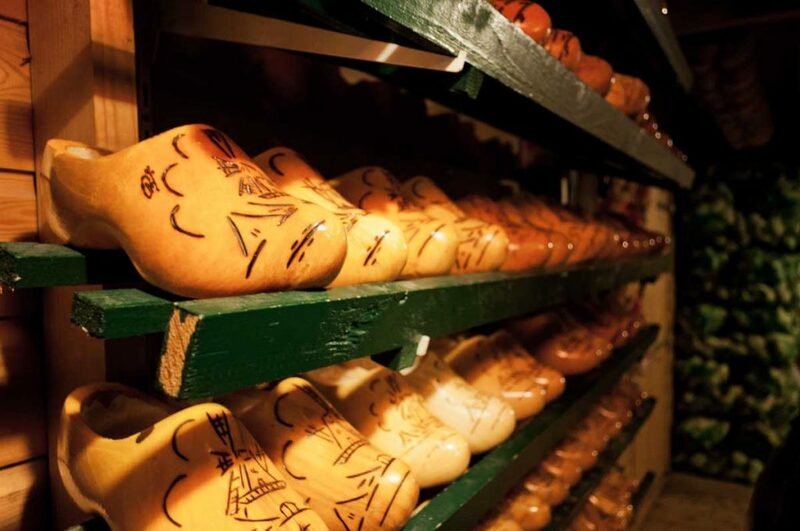 He charms the crowd and builds the audience’s interest in purchasing uncomfortable, impractical wooden shoes. Several fall for his charms. We fall for the charms of some freshly smoked cheese. Back on the bikes, we turn off the riverside path onto a tree-lined lane. At this point, the sky opens and an icy sleet cuts through the thick coats we’re wearing, turning our fingers blue. We pass a golf course where people are playing, unperturbed by the falling icicles. 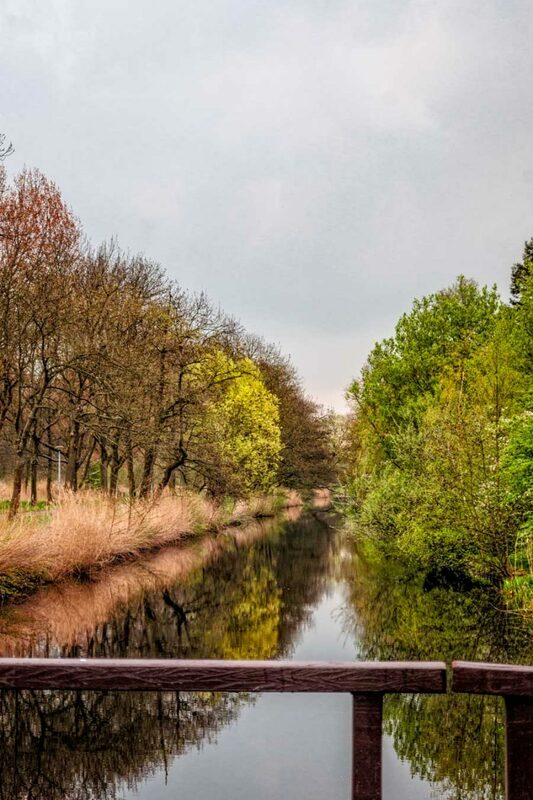 The pack of cyclists pass under birches, occasionally veering into suburban settlements before drifting back onto bike paths that lead to the het Amsterdamse Bos, a nature reserve built in the Great Depression. 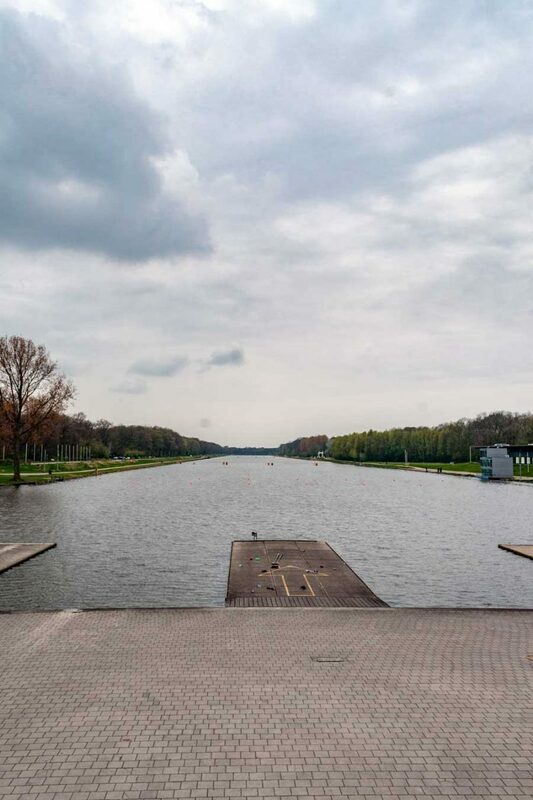 It includes the Bosbaan (the Olympic rowing lake) and a man-made hill, the only one in the region. In total, the parklands consist of over 134 km of footpaths and 51km of bike paths. Exiting the park we ride on towards the old Olympic stadium at De Schinkel. The stadium itself is small by modern standards and its red brick particularly dates it. But it’s not the stadium that our guide draws our attention to, but the calm waters of De Schinkel. Here lies a floating street of houseboats. 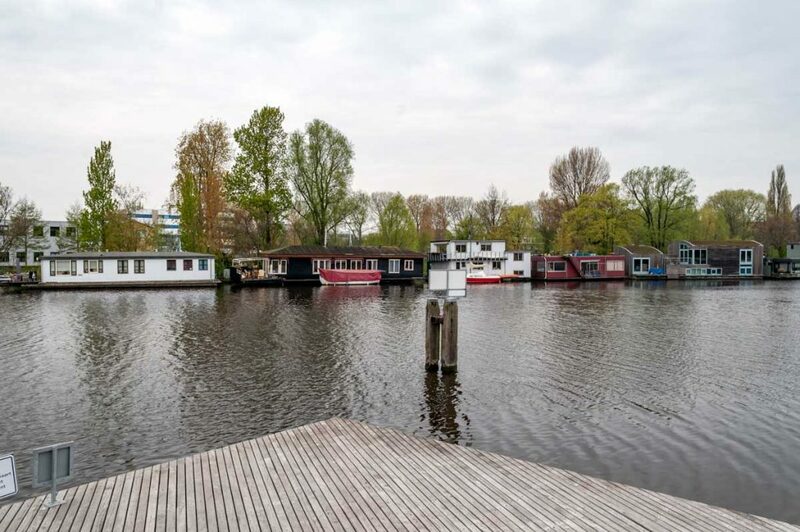 Each anchorage worth over a million Euro, not including the price of these rather deluxe houseboats. The final stage of the ride takes us through the scenic Vondlepark, which is a haven for every local and their bike and then on through a high fashion shopping area, before bouncing back along the cobblestones to Mike’s HQ. Dismounting from our trusty steel steeds, we’re all a little saddle sore; Jess more so than others. 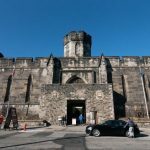 Sure, it’s an unapologetic tourist experience, but having a guide fills in much of the knowledge that Google maps can’t. 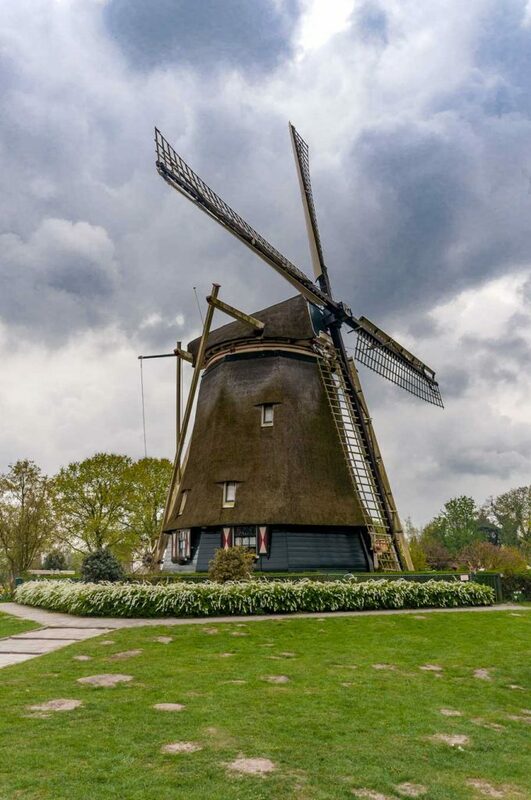 In a very short time, we were able to experience more of Amsterdam than the usual visit to the ‘cafes’ and Ann Frank Huis and even work off a little of the previous night’s cheese fondue. Amsterdam, you’re all right! Mike’s Bike Tour is a guided bike tour that takes you on a ride that gives you more of an idea of what Amsterdam is really like. 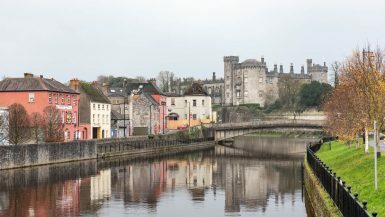 Mike’s Bike Tours offer two core tours. 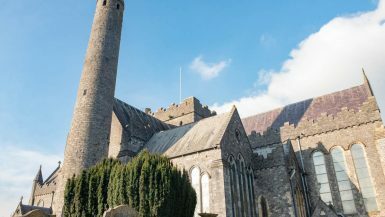 A city tour and a countryside tour. We opted for the country tour. Fees include bike hire and guide. They also offer “undercover” bike rentals so you don’t look like such a tourist – nice touch! March 1st to October 31st from 9am till 6pm. November 1st to February 28th from 10am till 6pm.